(Newser) – A 26-year-old Marine reservist is free after spending seven months in Mexico jails over what he says was a wrong turn. Sgt. Andrew Tahmooressi, who served two tours in Afghanistan, was arrested in March because he crossed the border into Tijuana with three loaded guns in his pickup, reports ABC News. 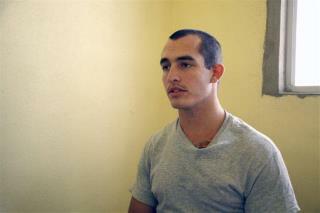 Tahmooressi says he made a wrong turn on a highway in California and never intended to go to Mexico, but authorities there cracking down on gun-running to cartels were unsympathetic. His family and a slew of high-ranking US politicians have lobbied since for his release, and a Mexican judge agreed to free him so he could be treated for his war-related PTSD. Since 2008, Congress has appropriated $2.1 billion to help Mexico deepen its commitment to the rule of law. How foolish and hypocritical to demand that Mexico now ignore the very justice system we've encouraged it to create. He was running guns to sell to the Mexican drug cartels. He had made many similar trips across this same border. His lawyer coached him not to admit to this. When he was at the border crossing he did not say he was lost ....he used this later as an excuse. Did you see the assault rifle? The automatic handgun, the assault style shotgun ..many magazines and hundreds and hundreds of rounds or ammunition. Bring him home? So he can start to run illegal guns north to Canada? Don't let his marine background cloud the truth. There are thousands of service members that have PTSD who haven't broken gun laws in 2 different countries, too bad law makers aren't writing letters and giving speeches about them, but this is a Jerry Springer society, I guess I shouldn't be surprised.